School programmes encouraging children to take more exercise and eat healthily are unlikely to have any real effect on childhood obesity, a study in the British Medical Journal suggests. Public health officials said they were working with industry to make food healthier. They also said a sugar reduction programme and the government's sugar tax would help to tackle childhood obesity. The researchers, from the University of Birmingham, said families, communities and the food industry probably had more of an influence than school initiatives. In the UK, one in four children starts school overweight and one in 10 is obese. By the end of primary school, the percentage of obese children has doubled to one in five. 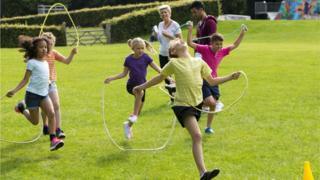 The researchers set up the healthy lifestyle programme for six and seven-year-olds in 26 primary schools. They then compared the results with more than 700 children in another 28 primary schools who did not take part. When the researchers followed up the children 15 months and 30 months after it started, they found no statistically significant reductions in BMI (body mass index) and no improvements in energy expenditure, body fat measurements or activity levels - compared with those not taking part. Dr Emma Lancashire, who co-ordinated the trial, said schools were only "one layer" in the fight against obesity in children and needed wider support from other areas. "Schools have an important part to play but other factors are involved too - families, the media and the food industry all need to be considered," she said. While some families had found the programme useful and had benefitted from it, she said this didn't show up in the results for all children who took part. "It's a complex problem and there is no easy solution." Dr Alison Tedstone, chief nutritionist at Public Health England, said its sugar reduction programme and the government's sugar tax on the soft drinks industry would help to tackle childhood obesity. "The evidence is clear that just telling people what to do won't work. To reverse what's been decades in the making, we need sustained action across the factors driving poor diets and weight gain." She said PHE was working with industry to make food healthier and had produced guidance for councils on planning healthier towns, while encouraging people to lead healthier lives. The government launched its childhood obesity plan in England in 2016. It said it recognised that change wouldn't happen overnight, which is why it had taken the approach it had - "not only working with schools, the NHS and local authorities, but also business, to cut sugar and calories in food before it hits our shelves and plates." BBC iWonder - Is BMI the best way to tell if you're healthy?